Distressed Vector Textures + 15 engraved retro elements is a must have collection of 31 vector textures and 15 engraved retro vectors. These textures are ideal for giving your work authentic distressed, subtle or halftone texture effects fast. Software compatibility: Adobe Illustrator CS6 and newer. .EPS files will work with a variety of programs such as Adobe Photoshop or Illustrator, Sketch, InkScape, Affinity, Corel Draw, etc. .PNG files will work with most graphic software. File size is approx 164.6MB (211.2M unzipped), offered as a single download. 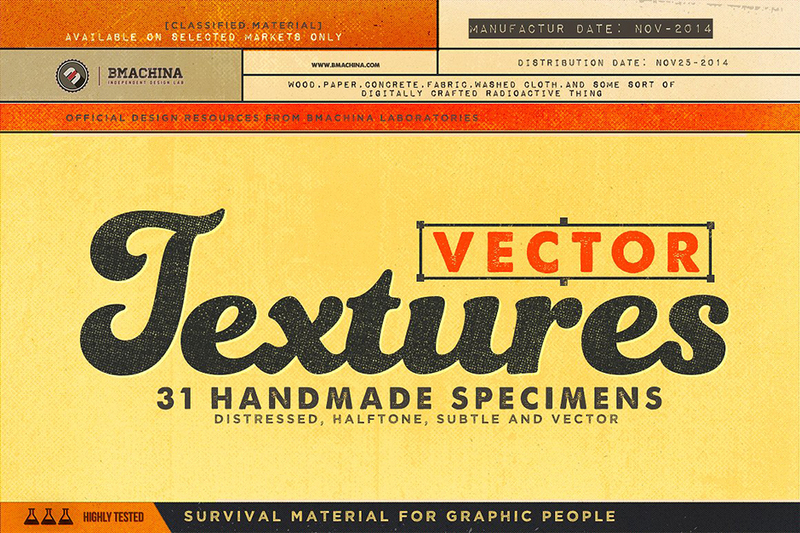 Wonderful textures and old vintage images. Thanks so much for this week’s freebie! Muchas gracias. Es una pena que los 9 elementos retro no estén e formato PNG. Thank you so much for leaving us a comment and we are so sorry for any disappointment caused by the compatibility of some of the files in this Friday Freebie! Thank you so much for your comment Colleen and we hope that you get great use out of all of your new resources! Fabulous textures!! Thank you again so much! We’re thrilled to hear that you love these Trina and hope that you enjoy working with them! You’re so welcome, happy designing! Thanks DC for yet another great freebie! Thanks for commenting and we’re so sorry for any confusion caused! As all of our freebies also come with our single-user extended license, we need to have this added to your account. Rest assured I have popped you an email to help you get up and running with these Athena! TGIF! I feel like a thief every Friday. These are great textures. Great Job – Love Them – Thanks so Much! Ha ha, perfect comment. So true! We completely agree Matt, LOL! We hope that you have great fun working with these, happy designing! These will come handy.I am going to create some 1970 styled shapes and add a vintage touch to them as an experiment! The images will look god in a greetings panel for a poster. We hope that you have great fun working with these!